touches of sense...: Another cycle. I just remembered my second tricycle. It was the red one which replaced the small blue one that I used to ride around the house dressed as the Lone Ranger, aged three. 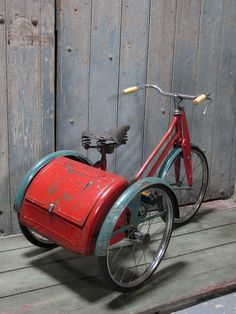 I don't have any photos of my second tricycle. I am fairly satisfied that it looked pretty much like this one on the left. It had a boot at the back for the trip to the grocers'. I seem to remember that the boot was big enough for a packet of cornflakes and a bag of potatoes. I have vague memories of pedaling for miles. Surely, it wasn't so far? It was the first time that I was able to leave the confines of the Rectory garden. Surely, I can't have been alone? I don't remember anyone being with me, so taken up was I with my new found freedom. I had quite forgotten about that red tricycle until now. A few months later, it seemed rather childish, that tricycle. I can't remember the colour of the bicycle. I remember distinctly crashing into a patch of nettles and brambles. I was stung by my overconfidence, by my wounded pride. There was no going back to the tricycle. It was consigned to memory. I would have to learn to keep my balance, to steer correctly and to give hand-signals on the open road. "So are you bringing your poems to Reclaim Hosting?" I was a little surprised that my 'secret' dabbling in WordPress and my 'secret' domain had been uncovered by Jim Groom. On the other hand, I felt reassured to be messing around in a sandbox with people that I was familiar with. I was not alone with the buckets and spades. I have been working on a website for the CLAVIER network. After exhausting all other "solutions" (excuses), I resigned myself to figuring out how to set up a domain, how to make a blog look like a website and vice versa. I spent a long time trying to avoid it. Wouldn't a Google site do it? Wouldn't a Blogger blog do it? Nope, they wouldn't do it. Wouldn't someone else do it? Nope they wouldn't do it. I tried to find a hosting solution at the university. I tried to find a hosting solution in France. Nope, I didn't know those guys, that wouldn't do it. I blame the people at Connected Courses. I was so happy with my red tricycle. It took me as far as the shops. I tweeted a message to Maha. She tweeted a message to Reclaim Hosting. I tweeted a message to Cogdog. I studied the CLMOOC website. I studied the CCourses website. I studied the Virtually Connecting Website. I know pretty much nothing about bicycle maintenance...er code. I cheated and found an application: "WordPress Theme Detector"
I started to understand a bit more about Themes and Plug ins. I read the posts on setting up a blog hub. I looked again at the posts on setting up an Activity Bank. I studied the Youshow: Unit 5 found on Cogdog's website. I signed up to Reclaim Hosting. I was so shocked how easy it was to create a domain that I did it three times, just because I could. Those sounded like nettles and brambles. I rode shakily around them. I was on familiar territory. It was rather like Blogger. It was rather like Google Sites. I crashed into the brambles and the nettles. What TF is a sticky post? What TF is a sticky header? What TF is a featured picture? I was beginning to miss the red tricycle. I could almost hear my brother laughing at my desperate crash. In a few months, I will have forgotten about the trip to the shops for the cornflakes. I will be going further afield. I will be roaming new domains. Now what shall it be? That red tricycle looks great with the new tassels and the Reclaim Hosting flag on the back! That's a lot of ground cover, in a few weeks what some of us spent years doing. As far as the domain, what's the intent? Is it a new home for this blog? It tough call since you have tachesdesens as a sort of name thing. Of course *.wtf is overly fun. Why not take 'em all? Blogger ate my comment. He starts again. Thanks Alan for dropping in. The red tricycle is still here at the moment. The bike that is on Reclaim is the site for the CLAVIER network thing. Once I've used that thing as a sandbox to learn and to get it up and pedaling I'll return to tachesdesens. CLAVIER is much more complex than my blog/website/artwork stuff. I will learn the hard way! So the domain(s) to come will draw together this blog/artwork/website/ et al. Can you have a domain ending .wtf? I was wondering what the limits were after reading your post about Cog.dog vanity domains. Enjoyed reading this update Simon and it is prompting me to use my time this morning more productively. I have a few hours in a hotel room staying out of the sun before making my way to the airport for my flight back from Italy. Time to get started on the auto ethnography I have been procrastinating about. Makes a change from bicycle maintenance! Teresa, hi! Thanks for dropping in. That auto-ethnography idea has been trotting around my head for some time. I would like us to see what we can do with that. I reckon that is what is at the heart of CLAVIER. The slides of Rob O'Dowd has me thinking that CLAVIER is a lot different from typical term long telecôllaborative projects. We really must document the emerging stories. That is one of the reasons for the clavedu website. It is a good place to sort stuff.